The Dolomite Ski Safari we recently completed started and ended in Cavallino d’Oro, a small hotel near the historic market square of Castlerotto, a village in the South Tyrol. 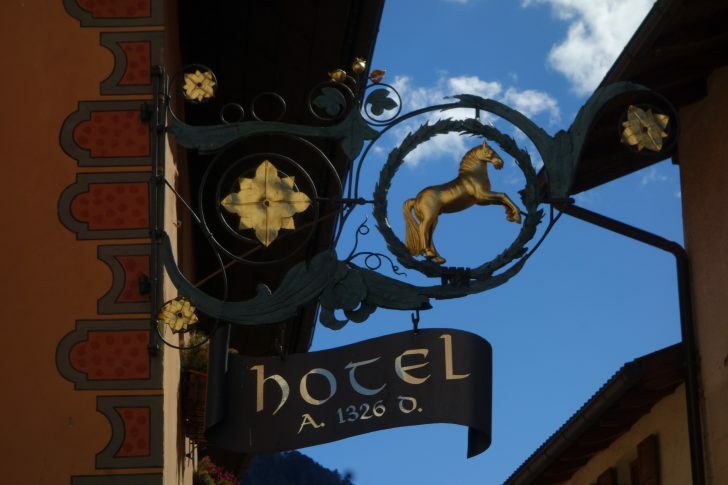 Cavallino d’Oro has been a hostelry for more than 700 years. Today it is beautifully appointed, comfortable, and welcoming. The superb Hotel Cavallino d’Oro in Castlerotto is more than 700 years old. The Dolomite range in the northern Italian Alps is a UNESCO World Heritage site, considered by many to be among the most beautiful landscapes on Earth. With more than 450 lifts and 750 miles of groomed terrain, it also is home of Dolomiti Superski, the world’s largest ski area. Although part of Italy, South Tyrol’s culture, cuisine, architecture and local dress are distinctly Austrian. The evening before we took to snow, Pam and I joined four other “ski safarians” for a briefing by Tim Hudson, Inspired Italy’s tour leader. We received new daypacks and Tim explained the most efficient way to load them. Decisions on what to take were left to us. We also got our lift pass for the week – a single RFID card that would give us access to every Superski lift. Following an explanation of where we’d be skiing and staying over the next six days, the group – three Americans, one Austrian, one Scot and one Brit — were off to dinner. We quickly established a toasting protocol that would be with us throughout the week: clink glasses only when there’s eye-to-eye contact. We’d be laughing a lot together over the next six days. By gender, the group was evenly split. Five of us were 60-75; one was 36. With one exception, all were competent skiers. Everyone was able to keep up with each carefully paced and packed day. It’s amazing what we can do without. I used the limited backpack space for second sets of underwear, long johns, and ski socks, a spare pullover, toiletries and meds, a pair of lightweight slippers, and a few incidentals. The pack wasn’t heavy, but it was inconvenient riding chairs. My parka was relatively lightweight. A NuDown jacket I’ve had for several years, it has an interior membrane and hand pump to create an insulating air barrier. If I didn’t own that I would have taken a shell. We were there toward the end of the season, with chilly mornings and warm afternoons. Eighty percent of Dolomite days are sunny. Had it been colder, layering still would have been the most flexible option. 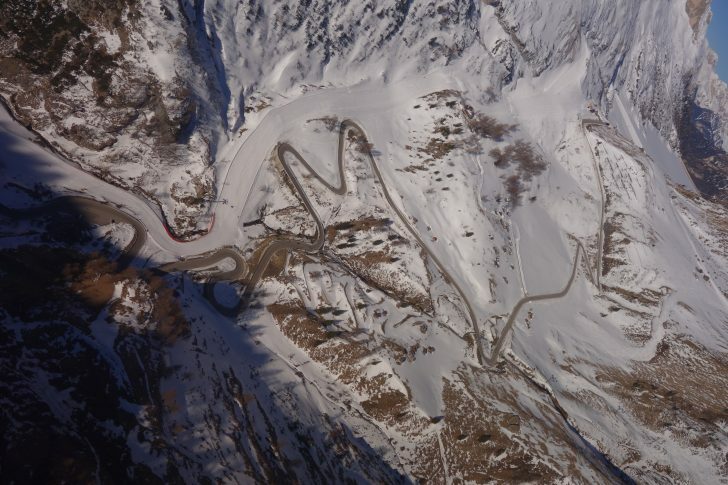 Our six-day route combined sections of the Sellaronda and WWI ski circuits, the latter, a virtual outdoor museum, crisscrossing major First World War battlegrounds. We stayed in refugios, small mountain hotels accessible by cat or ski. The accommodations ranged from luxurious to rustic; food, from adequate to superb. Buffet breakfasts around 7:30 included juices, yogurt, fresh fruit, cereal, eggs, cheese, salamis and prosciutto, breads and sweet rolls. An hour later we strapped on packs and clicked into our boards. We skied until a late-morning coffee break, then until an hour-long lunch break, followed by another hour or two when we’d arrive at the next refugio. Two consecutive nights were at one place. That day without pack, was especially pleasant. One refugio served a ten-course gourmet dinner. Another had a visiting chef from a seaside resort. Lovely to be served fresh seafood in a remote mountain lodge. It wasn’t a great snow season in the Alps, but snowmaking and sophisticated grooming assured generally good skiing surfaces. The only exception occurred later in the day at lower elevation. At my age, heavy corn is exhausting. Superski has many ways to get up the hill. We might start with a chair, then ski to a gondola, then take a series of cable cars or ride a magic carpet to a train worming its way through the mountain. Gondolas varied in size and shape. 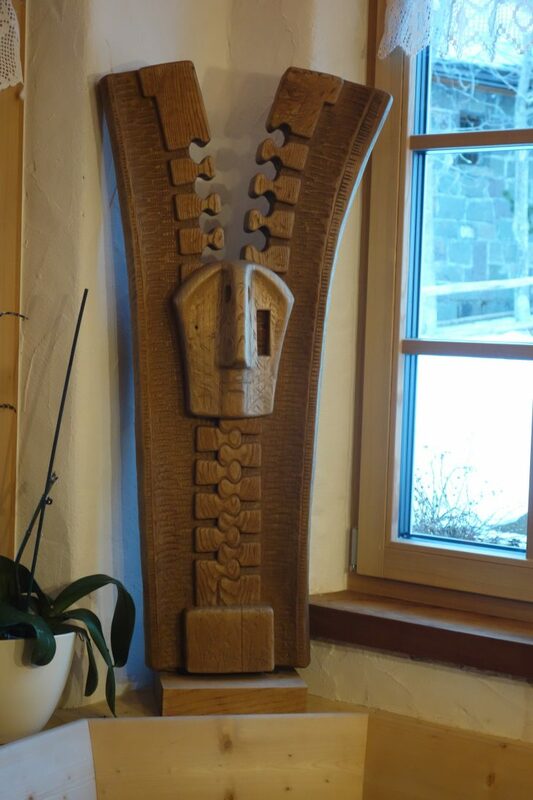 Unlike the ones in the U.S. many of these let you stand your skis in slots sunk in the floor. 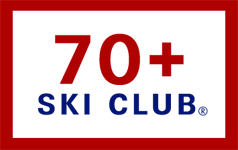 Throughout Superski, lifts are owned both by a variety of individuals and business groups. Owners share ticket revenue based on lift usage, thus providing incentives to construct new lifts, upgrade existing ones, and do what they can to attract more customers. A similar competitive business model exists in the U.S., but it’s spread across individual resorts. 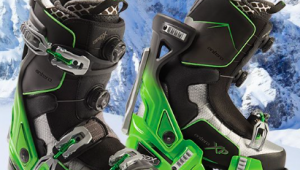 In the U.S. the rising cost of skiing has impacted growth. In Europe, costs are lower, and newcomers are flocking to the sport. I’ve heard people refer to a ski safari is a “once in a lifetime” experience. It’s so interesting, enjoyable, and affordable (prices this season started around $2800 for lodging, two meals, transfers, including helicopter and horse, tour leader, backpack, etc.) that Pam and I will probably do it again. 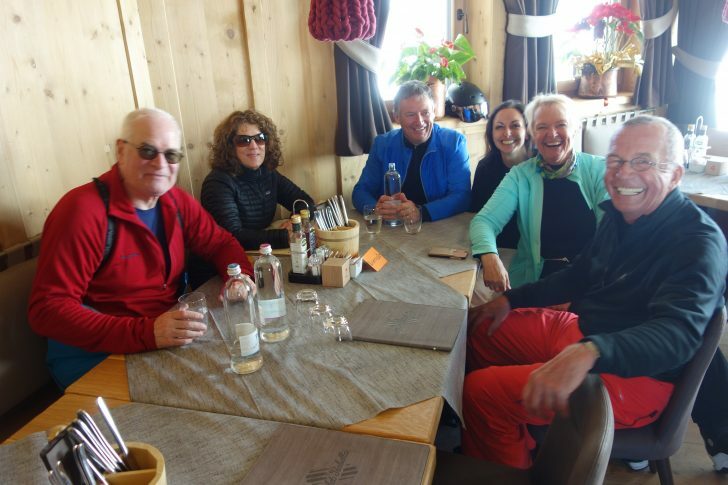 Indeed, Fritz, the 73 year old Austrian, was on his third ski safari with Inspired Italy. At the end of the last day, we skied a very long run into a deep valley and stopped at a trailside restaurant. Tim’s partners, Louise and Matteo, were waiting for us with a special cocktail. Our new friends and we lifted our glasses, looked into each other’s eyes, had another good laugh, and made our final on-mountain toast. I love these little travel diaries. I, too, have greatly enjoyed your travel reports and they are encouraging me to try some European skiing. Thanks for sharing. One would think the entire backpack capacity would be needed in just carrying the various trail maps. With 750 miles of trails and 450 lifts, it sounds too easy to become disoriented and arrive at the wrong place. Did this happen or did the guide use the latest GPS? Was there internet service on a “cell” phone while on the slopes throughout the mountain range? What weeks are the “dead” of winter? How late in the season does spring skiing typically run? 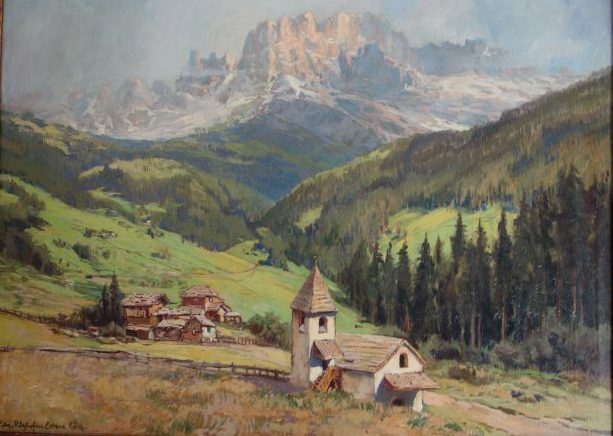 This sounds like every “lifer” should place Dolomiti in one’s “bucket” list! The group leader was very familiar with the route we took, and seemed to be very familiar with most of the terrain in general. I didn’t see a GPS, although he did use his cell to call ahead for taxis and busses, when we needed to use them. I believe the most reliable Winter snow is in January and February. We were there mid March. I just checked https://www.dolomitisuperski.com/en/Live-info/Open-lifts and saw that only 66 of 453 lifts are currently open. 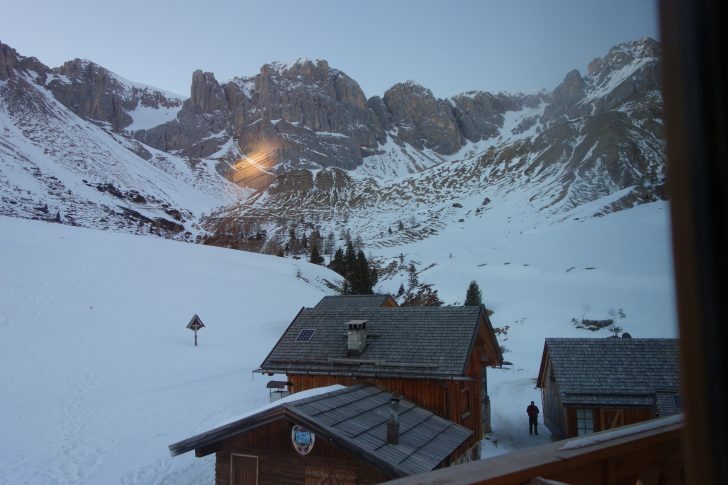 Agreed, Dolomiti needs to be in the bucket. Go there sooner or later. Our shelf life is limited.